After a lovely trip to Nerja and the caves, we were treated to a trip to Angus Steakhouse by Lee’s dad Chris. We had been to the marina before, but we had completely missed out the best side. 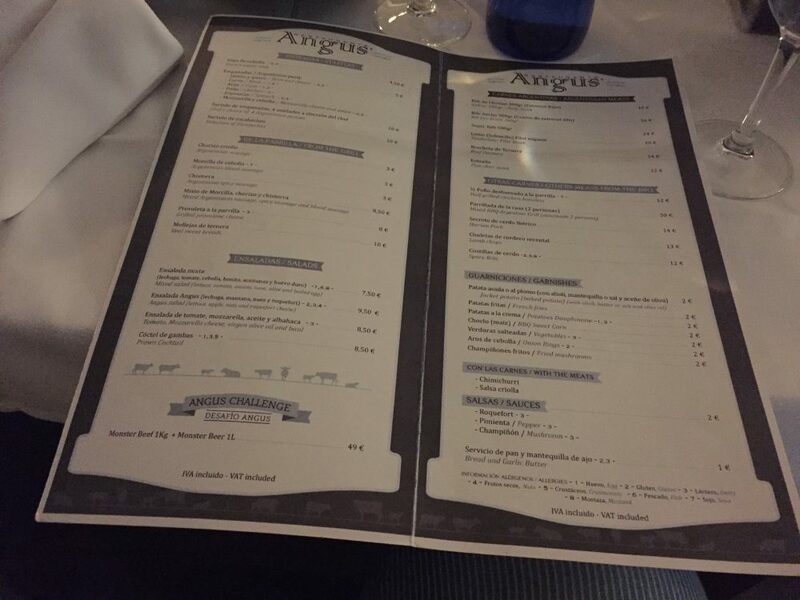 Let’s tell you more about the Angus Steakhouse. 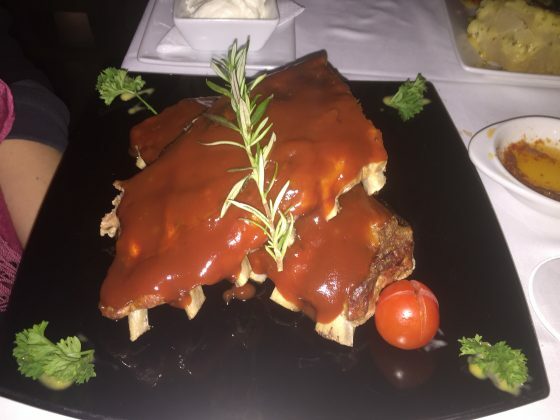 Right down on the busy Benalmadena Marina, Angus Steakhouse is lost among the many other restaurants on the marina. Also where they are hidden slightly out of sight of the main road in, you could be forgiven for missing the entrance or indeed the whole restaurant itself. There is plenty of parking around, which is FREE during the winter months. During the summer months, you will be hard pushed to get yourself a parking space, and god knows how much they charge for parking during that time. Well both of us love a good piece of meat. Lee had eaten a massive slab of steak in the states a few years ago but the 500g, half a kilo steak was incredible. From experience, many chefs when asked to cook the meat medium comes back either undercooked or medium well. I was tempted to ask for medium rare on the assumption it would come medium. I needn’t worry, the steak was cooked to perfection, and as you chop and chew through, I found that there was only one strip of gristle. 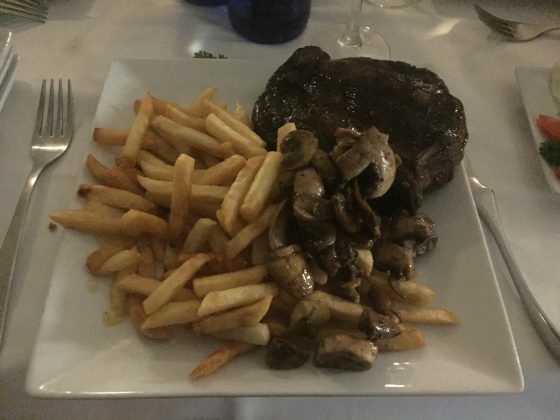 With Lees steak, he had some chips and sautéed mushrooms. Yum, Tina, however, had onion rings and jacket potato. All of which was nice. 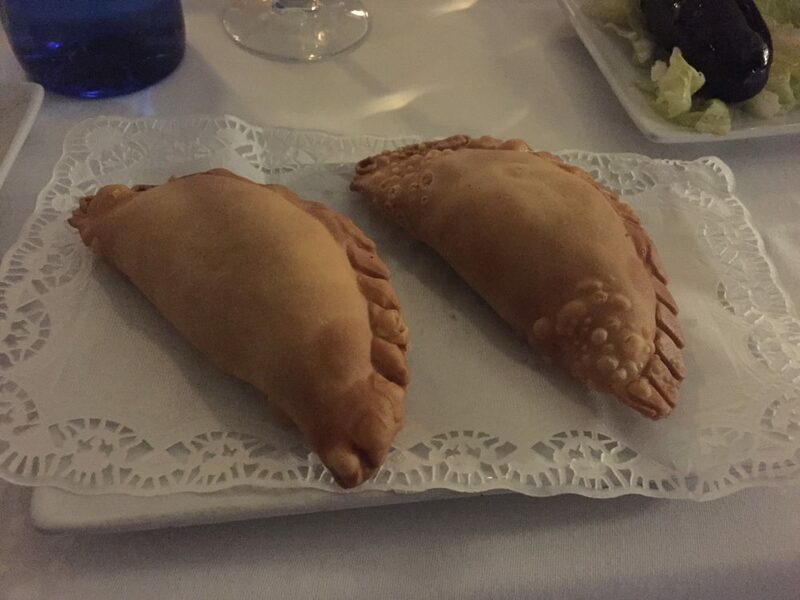 Before our mains though we had some bread and butter and a couple of empanadas, one chicken and one meat, the advice here. The chicken was not the best, still lovely but not as good as the beef one. For dessert. Yes, dessert did you think that we wouldn’t. 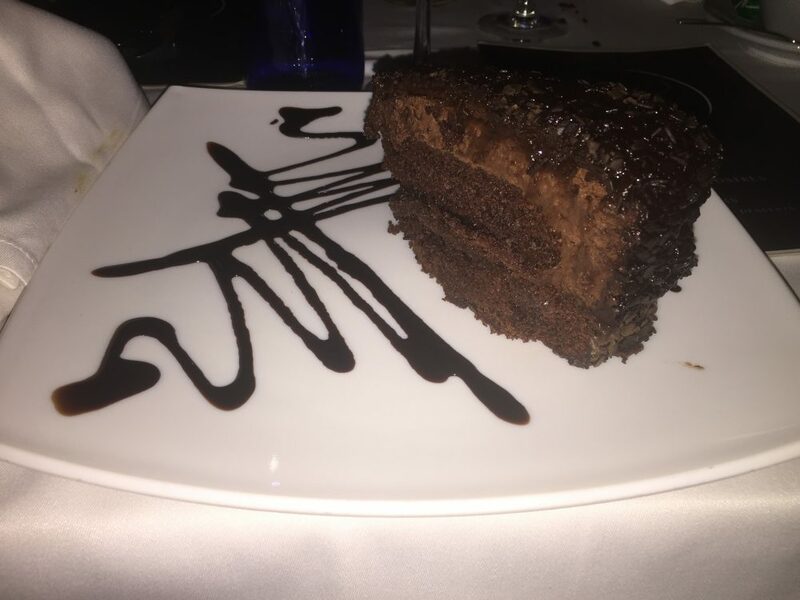 That’s what you have a dessert stomach for. I had a death by chocolate cake which you can see from below; I was lucky to survive from. 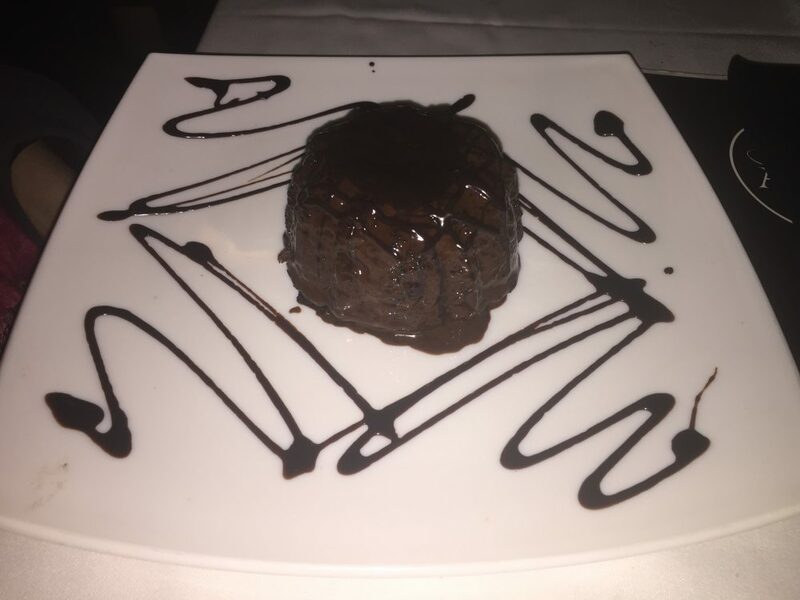 Tina had a chocolate fondant, which was a tad too rich for my sensitive taste buds. Right so let’s work all this out, the two empanadas were 6€, then Lees steak, chips and mushrooms came to 28€ and then the pudding came to roughly 5€. Tina’s meal and sides clocked in at 16€ and her dessert around the 5€ mark again. So when you add all that up, without drinks comes in at 60€, then with two glasses of water you’re looking at 66€ for three courses. Which in English money is £47 at the exchange rate of 1.4 we got on our credit cards. So let’s look at the cost of this back home, the steak of that size along with the sides would have come to about £30! So when you look at it that way, you do get great value for money. Well, we did go in the middle of December, it was dead. Which meant we got to choose the seats we wanted. Overlooking the marina, during the summer months or during busy times you will feel like you are on top of your neighbours. So close that you could get involved with there conversation from your table. That set aside; the low lighting created a nice ambience. With the view and the attentive, friendly staff we had a great time. Even if slightly tired from visiting the Caves of Nerja earlier that day. Everything For 1 Euro At Cerveceria 100 Montaditos… Yes Please!